Particle size in powder coating production is critical for the creation of high quality final products within required specifications. Every powder coating producer is tightly regulating their process in order to always achieve best possible results. 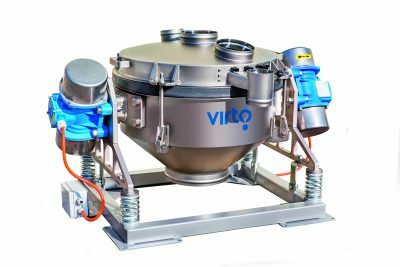 After the micronizing stage, the powder mixture is sieved in order to select the required particle size range and have it free from contaminations which might manipulate the high electrostatic charge their powder coating is designed for. Powder coating components (among which metal oxides or pigments) are dry, yet prone to agglomeration. Moreover, they tend to blind the mesh and therefore, an efficient cleaning system is always needed in a screening application, in order to keep the process fluid. Traditional vibrating sieves, usually employed in this industry, represent however some limits: their metallic meshes may leave traces into the sieved product following the application of mechanical or ultra-sonic cleaning systems. On the other hand, by eliminating the cleaning option, it is difficult to achieve screening of fine particle sizes. Finally, in order to overcome the blinding issue, screening precision is frequently sacrificed, with mesh aperture typically selected at a bigger size than it should. It is here that Virto-Cuccolini’s patented multi-frequency X-Line screeners series come into play, bringing to powder coating industry an unprecedented technological solution to critical points in screening phase. As our numerous supplies in powder coating industry demonstrate, X-Line is able to sieve powders within a contamination-free process, at a higher precision (i.e. 88 µm instead of 180 µm previously applied by one of our Customers) and at a higher capacity: in facts, our Nylon/Polyurethane mesh cleaning is performed by our special multi-frequency device, directly applied onto the mesh to keep it free from blinding. This all turns also into a screener size advantage, because our X-Line can be smaller than a traditional vibrating sieve. A finer mesh, allowing our Customers to add real value to their product in terms of particle size and freedom from contaminations. Would you like to check how Virto-Cuccolini’s X-Line is able to improve your powder coating production process? Contact us!